A migrációs-egészségügy az utazás-egészségüggyel kiegészítve – szabadon választható akkreditált képzés formájában – már megszokott, integrált része a graduális orvosképzésnek a magyar illetve angol oktatásban. A migrációs egészségügyről szóló oktatási panel integráns része a családorvosi és foglalkozás-egészségügyi graduális programnak a magyar, angol és német nyelvű kurzusban egyaránt. 2013-tól kezdődően a családorvosi rezidensképzésben is helyet kapott. A 2013-2014-es tanévtől kezdődően az oktatási program két további szabadon választható akkreditált kurzussal bővül: ’Az egészségügyi ellátás alapelvei az Európai Unióban’ és a ’Humanitárius segítségnyújtás orvosi/ egészségügyi alapjai’ címmel. Ez utóbbit a Baptista Szeretetszolgálattal közösen oktatjuk. 2010-ben a Pécsi Tudományegyetem kezdeményezésére alakult meg az a hat EU tagállambéli felsőoktatási intézmények konzorciuma, melynek célja, hogy kifejlesszenek egy nemzetközi mesterképzést a Migrációs Egészségügy kapcsán (MSc in Migration Health). A tantervet az ERASMUS program szellemének értelmében állítják össze, biztosítva a hallgatók illetve oktatók mobilitását egyaránt. A képzés 2014-ben indul. The concept: Current trends in the spread and the appearance of tropical diseases in areas of the World, where previously they were not observed (like chikungunya fever, malaria, dengue, etc. ), prompted Health Authorities to pay more attention to this ever increasing group of diseases. The curriculum of medical students in the EU countries do not pay much attention to the importance of those diseases, which can be easily imported by travelers or by migrants coming from third world countries. 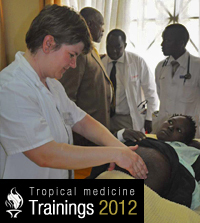 The UPMS decided to organize on site training courses in Africa, where the students would be able to see the real circumstances of the health care in a tropical country working with minimal resources, and to see, touch, perform physical examinations, take medical history of the patients and submerge in a totally different approach and culture to gain a better understanding and knowledge of diseases in the tropics, which is not similar, to participating at a slide show at home. The structure: The training course will last for three weeks and it contains 60 contact lectures (4/day), 30 lectures as practical/laboratory training with two external teaching options. The course will end with an examination. The teaching will start daily from Monday to Friday at 9AM till 13 PM with lectures, and from 2PM to 4PM with the practical training, which includes ward rounds, and laboratory practice, case demonstrations, etc. The UPMS provides 2x2 credit points for those, who completed the three weeks. Two credit points will be given if someone completed 2 weeks and performed an examination on the corresponding topics. The credit points are transferable between the universities. The curriculum of the course comprehensively covers the major diseases in the tropics and can be downloaded from the website. Technical information:The site of the training course is Kenya, Eldoret town, Moi Teaching and Referral Hospital. The proposed time and duration of the course is June 25. – July 13 2012. Students will be lodged in a rented house and in a local Guest House (Gracemont Guest House). Transport will be provided daily to the site and back of the training. Financing: Tuition fee of the course for the three weeks is 1200€/person, which can not be split, if someone decides to go home after 2 weeks. The amount can be reimbursed, if someone, due to serious reason, is not able to participate, cannot travel to the site. If he/she has already started the course, or the revoke of the participation is within 2 weeks from the beginning of the course, the tuition fee cannot be reimbursed. The amount must arrive min. of 3 weeks before the beginning of the training course to the bank account of UPMS. Other costs: travel arrangements are individually organized. International flights from EU to Nairobi and back is @ 800-1000 € depending on the carrier. From Nairobi to Eldoret and back local flights are available in the morning and evening for @ 130 USD. Lodging at the Gracemont Guest House is @ 35€/person/day for the single room, which includes breakfast, and washing. The rooms have hot shower, internet and TV. If students want to share rooms, the price is cheaper. At the rented house the rooms with a separate bath room with hot shower and internet will cost @ 10€/person/day. In the house everybody cares for himself/herself. Cooking facilities and wash machine is available. The average cost for daily expenditures can be calculated as 10-15€/person/day. Participants are expected to buy individual insurance, which includes health, accident, loss of life, loss of property, emergency evacuation, etc. Application:The websites of our institutions will have an application form to fill with all the necessary information. Applications must arrive till the 1-st of June. To apply and see further information, click here. The concept: Recent trends in the more frequent appearance of tropical diseases in EU and other industrialized countries due to increased travel and the migration pressure from developing countries, prompted the Health Authorities to promote knowledge of health personnel on this field. The “market value” of such knowledge is on the verge of increasing worldwide due to the need to recognize such diseases in unusual places, countries, or to attend those patients in different missions or in migrant communities. Instead of organizing slideshows of tropical conditions and diseases, our cooperating institutes (UPMS), decided to organize onsite training course for medical doctors & nurses who are interested to discover a new knowledge and skill in a different culture, with different facilities, minimal resources. The structure: The onsite training course will last for nine weeks and will end with an examination. The course contains 180 contact hours and 90 bedside/laboratory practice with four external teaching, including one refugee camp. The course starts every day from Monday to Friday at 9AM till 13PM with lectures and 14-16 PM with clinical/laboratory practice. For the nurses participating at the course, a separate, interactive tuition is organized between 9AM and 13PM. 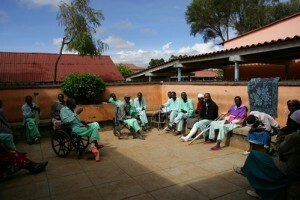 The afternoon teaching session is common with the doctors. The course is accredited in Hungary with 50 CME points and accepted in other EU countries. Technical information: The site of the training course is Kenya, Eldoret town, Moi Teaching and Referral Hospital. The proposed time and duration of the course is Sept. 3 – Nov. 2 for 2012. Participants will be lodged in a rented house and in a local Guest House (Gracemont Guest House). Transport will be provided daily to the site and back of the training. Financing: Tuition fee of the course for the nine weeks is 2500€/person, which cannot be split, or reimbursed, if someone decides to withdraw within 2 weeks before starting the course. The amount can be reimbursed, if someone, due to serious reason, is not able to participate, cannot travel to the site, etc. The amount must arrive min. of 3 weeks before the beginning of the training course to the bank account of UPMS. Other costs: travel arrangements are individually organized. International flights from EU to Nairobi and back is @ 800-1000 € depending on the carrier. From Nairobi to Eldoret and back local flights are available in the morning and evening for @ 130 USD. Lodging at the Gracemont Guest House is @ 35€/person/day for the single room, which includes breakfast, and washing. The rooms have hot shower, internet and TV. If students want to share rooms, the price is cheaper. At the rented house the rooms with a separate bath room with hot shower and internet will cost @ 10€/person/day. In the house everybody cares for himself/herself. Cooking facilities and wash machine is available. The average cost for daily expenditures can be calculated as 10-15€/person/day. Participants are expected to buy individual insurance, which includes health, accident, loss of life, loss of property, emergency evacuation, etc. Application: The websites of our institutions will have an application form to fill with all the necessary information. Applications must arrive before the 1-st of July 2012.